Hypnosis for the Seriously Curious, by Kenneth Bowers. NY: W. W. Norton (1993). Hypnosis and Suggestion in the Treatment of Pain: A Clinical Guide, by Joseph Barber. NY: Norton (1996). 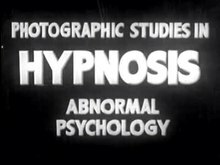 Hypnosis, Compliance and Belief by G. Wagstaff, (1981). Better and Better Every Day, Emile Coue, (1960). EBooks: The Power of Creative Visualization, Personal Transformation in 7 Weeks by Pradeep Aggarwal. ^ 催眠师要具备哪些基本貭素以及如何修炼 | 芳网. fangweb.com. [2018-11-26].